Pinterest inspired me to make this recipe and it did not disappoint! First let me say, I wouldn’t endorse making these potatoes every day, but I was looking for an interesting side dish to accompany a steak dinner I had planned for my husband upon his return from a business trip. He can devour a steak! These potatoes tasted like a baked potato with the toppings infused because they literally bake into the potato. 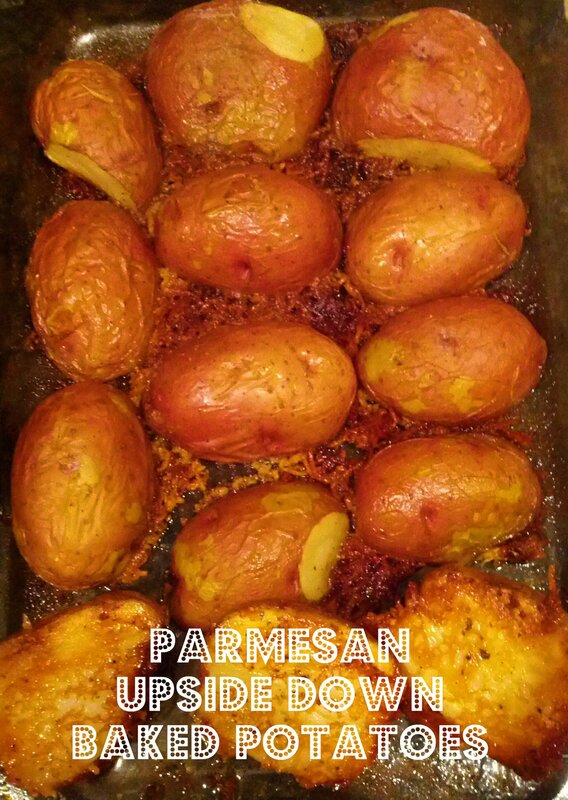 They are easy to make and a great switch up to a regular baked potato! 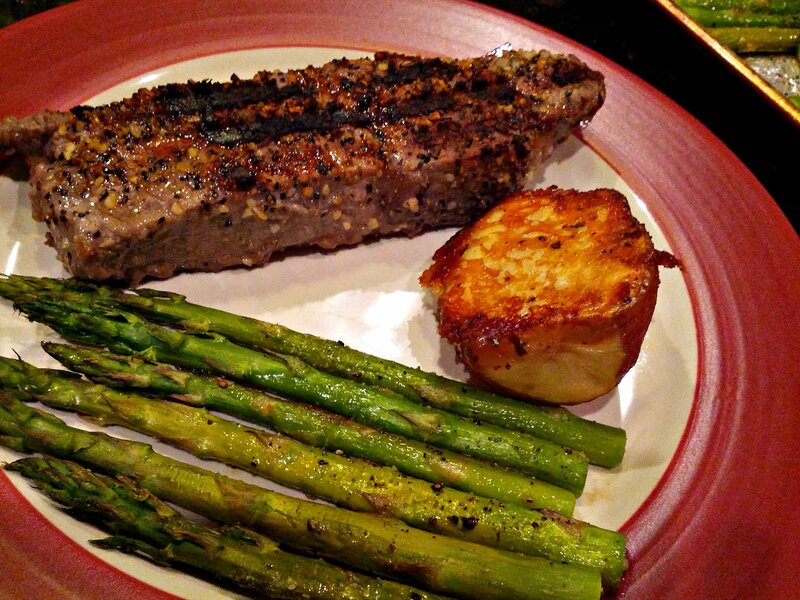 All you have to do is melt butter in a glass pan, top with shredded parmesan cheese, salt, pepper, and garlic powder. 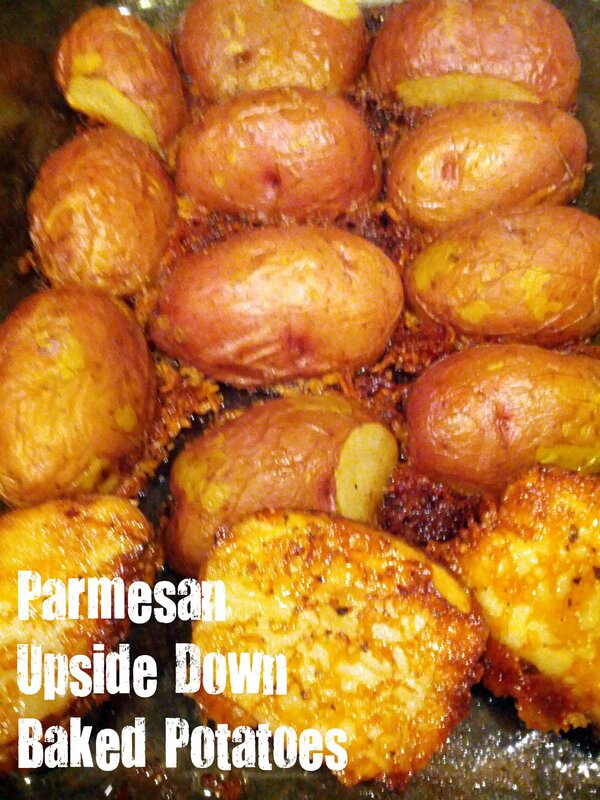 Then you cut your potatoes in half and lay them face down on top of the parmesan. You can season the other side of the potato, too. I love how unique these potatoes are in both taste and appearance! The original recipe called for 1/4 cup of butter, but that seemed like way too much. 3 tablespoons is plenty, and next time I might try them with just 2 and see if that works! If I had fresh rosemary on hand I would definitely add that too! 1). Preheat oven to 400F. Melt butter in the bottom of a 9×13 glass pan. 2). Sprinkle parmesan cheese and seasonings over butter. Place potatoes cut side down and sprinkle more seasonings on top of potatoes. 3). Bake for 40-45 minutes or until cooked through. Allow to cool in the pan for 5 minutes before serving. Hi Audrey! My readers just loved this! I wanted to stop by and thank you! I found the recipe on another website, so I didn’t know where it originally came from. I added links to your website this morning… and a note to readers to stop by and see you, sweet lady! Thanks again! did you use fresh grated parmesan or the parmesan in the plastic container? I know that freshly grated always tastes best, but sometimes the prepackaged works better in a recipe. The potatoes turned out great but the cheese got hard on the cool down, next time I will cook the potatoes part way through then put them on the cheese to finish the yummy goodness. I just saw that I am out of butter, can I use margarine? SO yummy!!!! I made them this week and had to share your recipe with my followers! My daughter asked if I would put bacon in next time (she is wise beyond her ten years). Have you tried it with bacon???? I made these tonight as part of a Pinterest meal blog post. They were very good. I added the rosemary, which is a favorite of mine with potatoes. Thanks! Didn’t have shredded Parmesan in the house so I tried sharp Cheddar instead. The potatoes were nice and soft like a baked potato should be but the cheese just hardened into an almost burnt mess. Was it the cheese’s “fault” ? I followed the instructions for everything else so I really don’t know what went wrong!! Hi there! I have not tried it with cheddar cheese, but I would not recommend substituting it for the parmesan. In this recipe, the parmesan is a key player. Parmesan cheese is a slower-melting cheese due to its higher protein content than the cheddar cheese–I believe this explains what happened to you. I’m so sorry it didn’t turn out well with that substitution! Thanks for commenting, and please give it a try with regular parmesan next time! I didn’t have any shredded parm on hand, so I decided to use grated parm along with leftover baked potatoes to make you your recipe. It was absolutely delicious and the Kids loved it too, so that’s always a plus. Loved it! I have been meaning to tell you….this recipe is equally yummy with sweet potatoes! Oh awesome!! I am soo excited to know that! I will definitely try it with sweet potatoes now. Thanks so much for letting me know! Awesome! So glad to hear that!! Tried these tonight! Awesome! Saw another comment about bacon, so I put a little slice of bacon on top of the skin side. And, used crushed garlic cloves (I was out of garlic powder). Hubby loves it! Thank you sharing. HI there – I grew up with my father making these potatoes. (He called them “okie” potatoes) Thank you for your post as I never knew the temp to cook them at and how long to cook them. Oh and we use any type of potato and none ever tasted bad! This recipe is all over the internet. I don’t know how anyone could lay claim to the original recipe. My friend has been making these for a couple of years. That being said, I’ve made them often and they’re great left-over. I made them into potato salad and it was amazing. Just made these with our supper of Chicken Maple-Dijon! It was so good!! Hoping there will be some leftover for lunch but not holding my breath! !